TheBlueGuerilla: EXCLUSIVE: UKIP Leader Farage Eyes Up Boston & Skegness Seat for 2015. 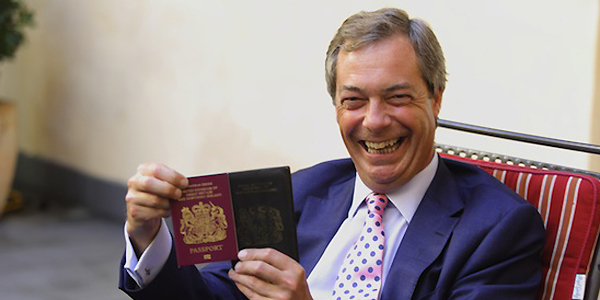 EXCLUSIVE: UKIP Leader Farage Eyes Up Boston & Skegness Seat for 2015. Foreign Office Minister Mark Simmonds should watch his back. With current UKIP PPC Chris Pain still in the dock over alleged racism on Facebook it seems as though somebody else is eyeing up the seat of Boston and Skegness at the next election. tbg can today exclusively reveal that UKIP Leader Nigel Farage who stood against speaker John Bercow in 2010 is now being lined up to stand against Simmonds in 2015. UKIP took a number of seats in the constituency on the County Council in May including some noticeable big scalps. Today a study for the Electoral Reform Society says that if UKIP follow the same approach that the Greens took to win a seat in Brighton in 2010, then Farage could have a serious shot at getting into the Westminster set up himself in 2015. Follow up - Tory MP Mark Simmonds 'Bricking' it in Boston. The allegations against Chris Pain have proved to be false. where is the source for the allegations being false please? Or is this standard kipper claims?